The worst thing about living in Australia is that you hear the whispers come from overseas about films which have yet to be released here. So when I started to hear that “Eat Pray Love” was getting bad reviews, it wasn’t a massive surprise to me. I read “Eat Pray Love” in the middle of last year and I loved it. I love Elizabeth Gilbert’s tale of self discovery while travelling over the world. Some people severely dislike the book or find it really hard to get into. I think I loved it so much because I went through a stage of selfishness where I jet-setted to the other side of the world to do something for myself after giving too much of myself to someone else. However, my journey took me to LA, not to Italy, India and Indonesia. LA was the right place for me to go and find myself though so I’m not complaining! Being big on travel as well, I loved hearing about the three countries that Gilbert visited. Italy, India and Indonesia are three countries I am dying to go to, even though I have been to Bali before. Again, films act as a great tourist tool. I stand by this fact because people love going places and identifying with it because of a movie. And there is no better way to get excited about going somewhere than to watch movies about it. Anyway, before I went into “Eat Pray Love”, I knew what to expect of it and why it wouldn’t be everyone’s cup of tea. “Eat Pray Love” is a selfish memoir. It is all “me, me, me” for Gilbert. It doesn’t bother me, but I could see how it would other people. And memoirs are great storytelling for books, but they are not always well interpreted on the big screen. I knew “Eat Pray Love” would be one of those memoirs that wouldn’t be. There is no real beginning, middle or end and no major conflict where the story takes a turning point. Gilbert’s book is really a collection of thoughts, which can only be thought, not seen. It may seem like a great idea for a film, but it should have just been left as is. It’s a good book, let’s not destroy it. These are my own words and here is my review. “Eat Pray Love” by Elizabeth Gilbert could well be known as the most successful girls book to be released in the past 10 years, the movie is very far from the best chick flick to be released in the past 10 years. It is purely a case of the book should have been left alone and not meddled. There are some good points about the movie, but it isn’t a story. The book isn’t even a story, it is a collection of Gilbert’s travels and thoughts about her life and her past few years. There is no suspense in the book at all as it is not that type of story. Therefore, putting it on the big screen was never going to work and was always going to leave a sour taste in audiences and critics mouths who were going to see it. Liz Gilbert (Julia Roberts) has decided for the first time in her life to devote her life to herself rather than her ex husband or current boyfriend. She has decided to go on a journey of self-discovery by spending 4 months in Italy, 4 months in India and 4 months in Indonesia. Along the way she meets lots of people who make a difference in her life and make her see the world differently. 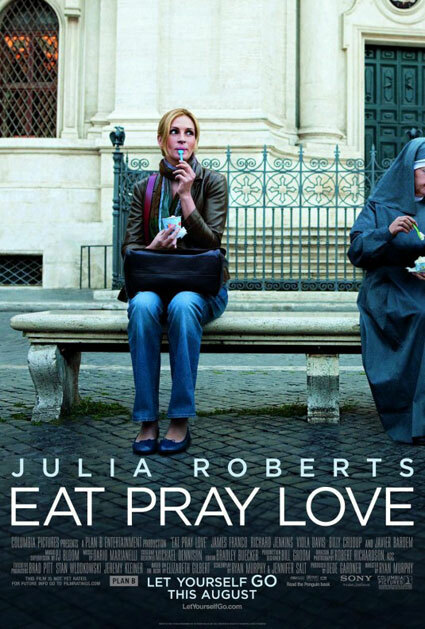 The production of “Eat Pray Love” has good intentions behind it. It is bringing Gilbert’s book to the big screen in order to send out a message to women out there, who may not read the book that sometimes you do need to be selfish and let yourself go in order to be at peace with yourself. It is a good message to be sending out, but it gets entangled in this film that falls short of the bar which its enormous amount of promotion has set. The movie just comes across as an enormous amount of selfishness set up against some amazing landscapes. The best thing about the film is definitely the presentation of Italy, India and Bali. These three countries are sure to attract many tourists because of the beautiful way in which this film was shot. The camera techniques chosen are amazing, and Julia Roberts is a wallflower compared to the scenery. For the life changing experiences that Gilbert goes through, there isn’t as much emotion as what you would expect. There is no feeling to the beginning or any part through it. It’s all nice is the only word to describe it. The majority of the film is just bland. It is also not a short film as there is so much to cover. Two and a half hours of this film may be way too long for some people. Julia Roberts is not bad in this film. She does give her role as Gilbert everything she’s got and performs to the best of her ability role the role she played. It is certainly no “Erin Brokovich”, but she does well in a bland film. Richard Jenkins also does well in his role as Richard from Texas. His character perhaps has the most amount of character out of any in the film. On a side note, it is interesting that Tuva Novotny, who is a Swedish born actress, can manage to play Swedish girl, Sofi and speak with an American accent. Something has gone wrong there. It is sad to see a film which is hyped up so much fall short of everyone’s expectations. What is even more depressing is that the book shouldn’t have been made into a movie at all and should not have been subject to the back lashing it has received just by existing. It should have been left as a type of self-help book for girls and the peace would not have been disturbed. On the other hand, it will always be a good movie to watch if anyone is planning on eating gelato in Italy, meditating in India or just chilling out in Bali. I too loved the book...I wanted the movie to be good and hoped it would be good...but you're right, it was average at best. Sigh.